New Catalogue & New Special Offers! Wow – what a week it’s been already! I can’t believe that today is the last day of August – but that means there is more exciting stuff coming up! First – starting tomorrow, September 1st – you can order directly from me, from the new Holiday Catalogue! Want another good reason to celebrate tomorrow? Well, if you’re like me, you’ve been missing the Weekly Specials that Stampin’ Up! had been running for a while… Well, starting tomorrow – there’s Special Offers! That’s right you can save 25% on Select Annual Catalogue Products between Sept. 1st and Sept. 21st! 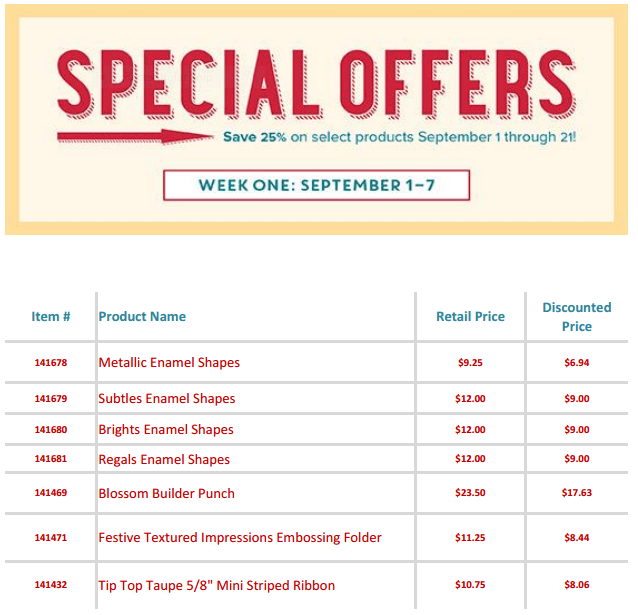 Each week (each Thursday) through Sept. 21st, Stampin’ Up! will be posting a list of select products from the Annual Catalogue that will be available through that week. So, you’ll want to check back weekly, because the selection will be changing each week! To order, you can either go direct to my ONLINE STORE, or contact me, and I’ll be happy to place your order for you. And YES – you CAN INCLUDE these Special Offers with your Holiday Catalogue items, and any other items you may be ordering. Now, I’m off to finish a very special post for tomorrow. Why special, you ask? Well – to start with, tomorrow is our 1 Year Blog-iversary for the Blogging Friends Blog Hop! And guess what? We have a VERY, VERY SPECIAL GUEST BLOGGER joining us!! Nope – no hints! You’ll just have to come back tomorrow, and read for yourself 🙂 Trust me – you won’t want to miss this! Next Next post: Blogging Friends 1 Year ‘Blog-aversary’!